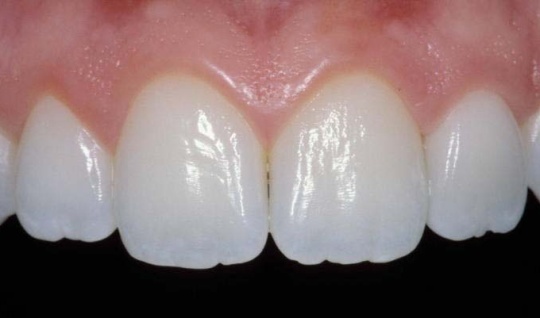 I’m curious if you can reduce the shine on porcelain veneers. Mine are unnaturally shiny looking. There’s so much shine on them they don’t look anything like regular teeth, more like a overly waxed marble floor. Is there anything I can do about this? When you pay money for a beautiful smile, this is what you should get. I’m very sorry you didn’t. I’m going to make a very good guess that your dentist isn’t an expert cosmetic dentist. Those who are create stunning smiles. In fact, most of them have a beautiful smile guarantee. While the shine on porcelain veneers is an important part of what gives it their beauty, they have to be done properly to achieve that result. Even more importantly, the glaze is what protects the veneers from picking up stains. However, in your case it sounds like the glazing wasn’t properly done. Here’s what can create a fake looking shine. Look at the picture directly below. Notice that although these teeth have a beautiful shine, there’s texture. This makes the shine look natural. In fact, one of those teeth are fake. You probably can’t tell which one. The likely reason your shine looks unnatural is it is flat. It wasn’t given the texture of natural teeth, which makes the teeth look fake. 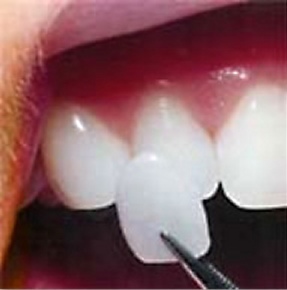 You can remove the glaze by allowing your hygienist to clean your teeth with a prophy jet. However, doing that will actually cause your teeth to pick up stains rather quickly. I would not recommend removing the glazing. Instead, I’d ask your dentist to re-do them properly. If your dentist hesitates, it may help you to get a second opinion from an expert cosmetic dentist. Look on mynewsmile.com. All the dentists they list are expert cosmetic dentists. They’ll be able to let you know what’s wrong with the smile and help your dentist to understand that as well. If your dentist doesn’t think he can follow through. He may be able to give you at least a partial refund.